Islamic ideas about women and their role in society spark considerable debate--both in the Western world, and in the Islamic world itself. Despite the popular attention surrounding Middle Eastern attitudes toward women, there has been little systematic study of the statements regarding women in the Qur'an. Barbara Stowasser fills this void with this study on the women of Islamic sacred history. Women and the Qur'an, Traditions, and Interpretation presents the Qur'anic revelations on female figures associated with God's prophets from Adam to Muhammad. Revealed narratives and legislation are then pursued through their medieval, modern, and contemporary interpretations. The theological exegetic sources here chosen, all Sunni, include the major classical works as well as, for the modern period, examples of modernist, traditionalist, and fundamentalist exegesis. For Hadith materials beyond the theological tafsir, Stowasser analyzes both popular narratives of the "tales of the prophets" genre and also representative samples of the classical historical and legal Hadith. A close reading of modern sources, including by lay writers, shows the waning influence of these traditional materials in present-day Islamic thought. By telling the stories of the women of sacred history in Qur'an and interpretation, this book presents an introduction to past and present Islamic paradigms of doctrine and their socio-economic and political applications. 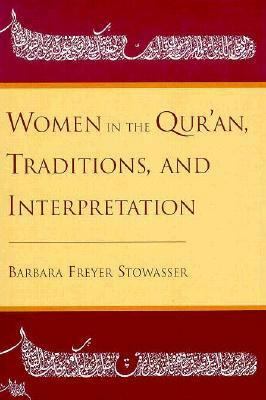 Stowasser establishes the link between the female figures as cultural symbol, and Islamic self-perceptions from the beginning to the present time.Stowasser, Barbara F. is the author of 'Women in Qur'an:trad.+interpretation' with ISBN 9780195084801 and ISBN 0195084802.